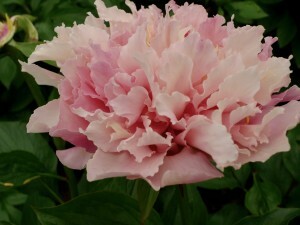 Luriel, in Denmark, has directed me to the Japanese email address www.shikoku-garden.com where one can find a page entitled “Peonies For Shade”. Therein are listed P. japonica, P. obovata, and P. o. ‘Flame’. All these are listed as hardy to Zones 4-8 but these numbers do not correspond to US Dept. of Agriculture zones. When looking at the Japanese zones for Hokkaido (provided on this website) one finds they are native to areas where the average January temperature is 10-25 F. (-12 to -4 C.). That’s two zones warmer than my USDA zone 5. 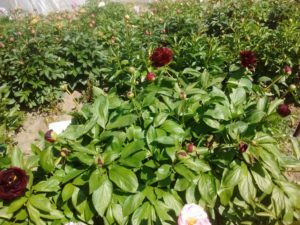 This nursery specializes in rare or lesser-known plants, ships overseas, and they are wholesale. I hope the ashes have washed off Carsten’s head. To find the meaning of “coriacea” all I had to do was consult my English dictionary to find that “coriaceous” is an English word with Latin roots, meaning “leathery; tough”. Just like “intersectional” is an English word with Latin roots. About blue peonies. Consider that hybridizers of daylilies (Hemerocallis) have taken species colored only in yellow or fulvous orange, without eyezones or picotee patterns, and single in form, and developed doubles, dark eyezones and lighter water-marks, and in an arrary of colors — white, pink, red, black-red, purple, lavender. The eyezones (flares) are so large that they cover most of the base-color and contain within them several bands of color. Some of the doubles are not just stamens converted to petals, but are crested doubles where extra petals arise from the mid-ribs of the three normal petals, leaving the stamens and pistil intact. The edges come in yellow, orange, red, purple, white… and some breeders are working on green picotees. Blue color is another objective. Some see a little blue in the purple/violet eyezones. They believe true blue will occur here rather than in the base color. Many have named seedlings with “blue” in the title, but everybody agrees they are shades of lavender. The late Steve Moldovan spent a lifetime breeding daylilies, always hoping to obtain the elusive blue. Only a year or two before he died, he said true blue appeared in the eyezone of a seedling. He named that seedling “Piece of Sky” and it now sells for $300. So where did all these traits come from? I have read that all of evolution is driven by the engine of mutations. Mutations that don’t help the plant survive are not passed onto the next generation. 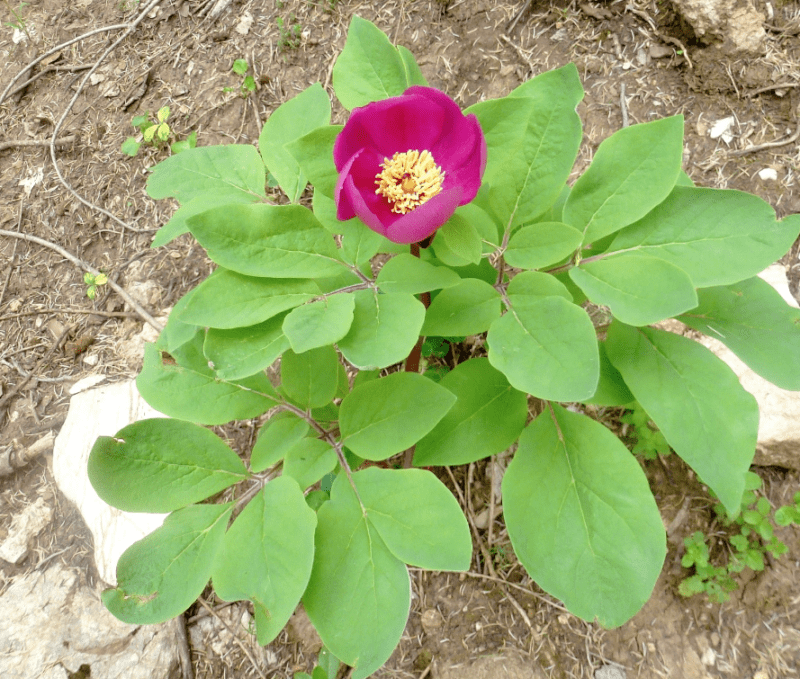 Slight mutations in color wouldn’t help much in a plant’s survival, so most would be lost. 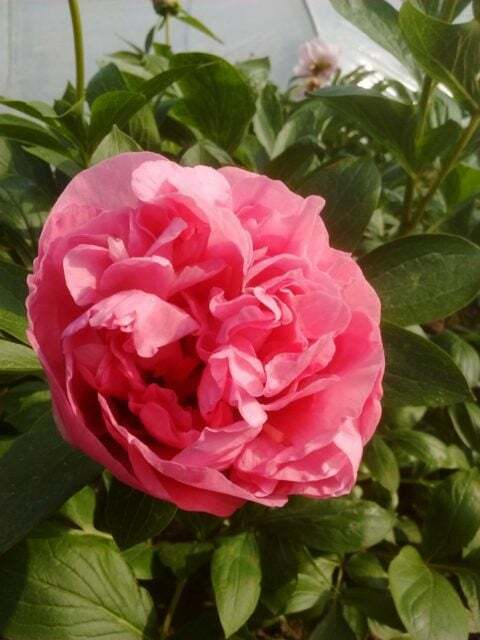 But when noticed by a plant breeder, that plant would be saved as a parent for the next generation. You know the rest of the story. One of the ancestors of ‘Piece of Sky’ has a very dark eyezone, black if you will, not just a dark purple as is common. Tag pointed out that there might be some connection here with the potential to produce blue. Years ago, Roy Pehrson sent me a black-red seedling, herbaceous hybrid, with the parentage marked as “Sable/Eclipse”. ‘Eclipse’ has a black-purple flower and is from officinalis Rubra Plena x coriacea. This should be a tet. Sable is a black-red lacti, single, so the S/E seedling from Roy should be a triploid. I crossed it with Saunders’ 16350 F2 (since named ‘Blushing Princess’) and obtained a blackest-red seedling, 74H120-2, which must be tet as it crosses well with other known tets. It is double, and should be given a name sometime. One of my only two plants was dug by Nate Bremer last fall and divided. It had a nematode infection and Nate gave it a hot-water treatment. So he may have it for future distribution. Now consider a possible connection between black and blue. (I’m not thinking of black-and-blue bruises.} Coriacea has given rise to lavender in ‘Lavender Strain’ and to black in ‘Eclipse’. Lavender is certainly a step toward blue, and black flares are in the background of H. ‘Piece of Sky’. Coriacea is rose-pink and shows no sign of blue. But its very limited use in breeding, so far, would seem to indicate it has some hidden genes that might contribute to lavender, lavender-blue, and blue colors. Small incrumental mutations toward blue might eventually produce the real thing. Outside of the scientists’ laboratory, what other course might one follow? Are there any lavender-colored species out there? or lavender herb’s hybrids? Coriacea and 74H120-2 or some other black-red should be combined. Coriacea pollen onto a later-flowering, white lactiflora should be tried, even thought triploids would be expected. Lavender Strain pollen onto white lactiflora (or ‘Sable’) could produce a tet of desirable color. LS is triploid, and so an unreduced gamete onto diploid lacti would produce a tetraploid. In P. rockii and its hybrids, the flares are very dark, almost black. Perhaps this indicates a potential to blue. In daylilies, some Florida growers raise 10,000 to almost 40,000 seedlings per season, with bloom the first season. With so many plants to choose from, it is no wonder that they can find so many incremental deviations toward some new objective. If blue is one of those objectives, they may well succeed. 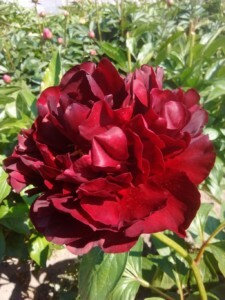 With peonies, we have no such advantage. Blue is a rare color in flowers. 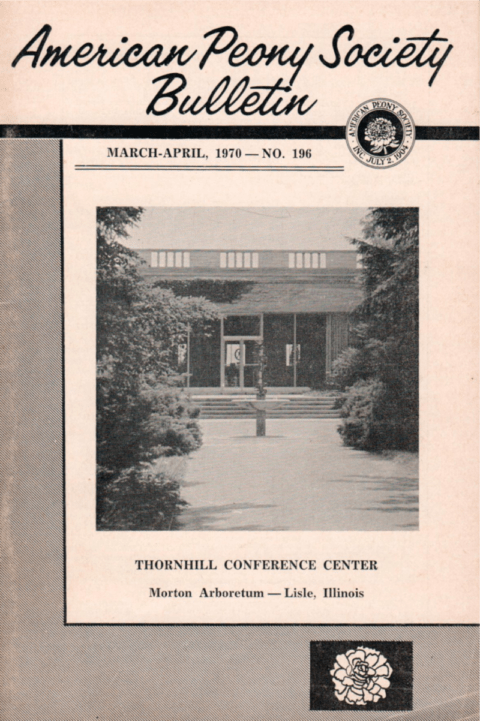 How did it come about? In eons past, did some lavender or purple flower mutate toward blue? And was some insect, moth or butterfly, drawn to the blue color and thus insured its survival? btw, I once joked with another hybridizer that 74H120-2 was so black that I intended to buy up all the black-red seedlings that other breeders had, then stomp them to death so that only mine remained. Like some fellow did with tulips during the tulip-mania in Holland. The petals of this plant are marred by pollen. Even the double flowers have interspersed stamens. A backcross to Sable would produce sterile triploids… and no pollen. The pollen is quite whitish, but it is still viable. I no longer have Sable and don’t hear much about it. It would be too bad if it becomes extinct. I neglected to mention earlier that ruffling, to the extreme at times, is common in modern daylilies. This again is an added-on trait, the species being quite plain-edged. 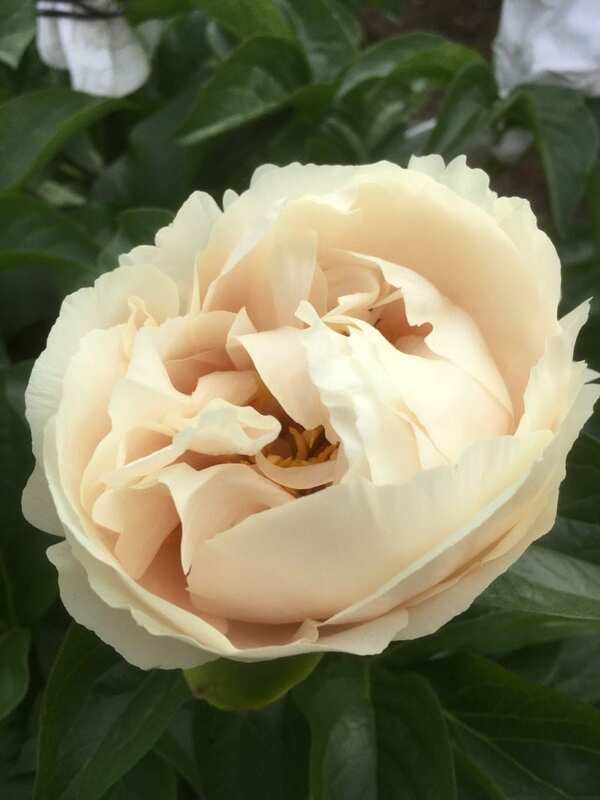 Ruffling has been increased in small increments for so many generations that one breeder, Patick Stamile, said matter-of-factly in describing one of his 08 introductions “Ruffling is dominant over plain petals”. 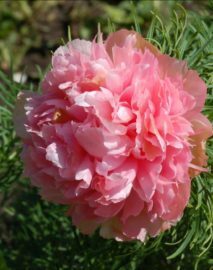 I replaced “ruffling” by “doubleness” and felt that one could say, about peonies, that “Doubleness is dominant over singleness”. This is especially true if the doubleness extends back several generations. 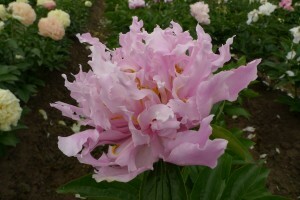 Think of the parentage of htp ‘Alice Harding’ or ‘Waucedah Princess’. In each, one parent was the lutea species and the other a double Japanese moutan, but the progeny were very double. 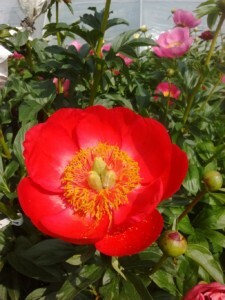 By the way, wouldn’t ruffling — and picotees, too — be great when added onto some peony flowers? You younger hybridizers should work on this in your spare time. Did anyone ever noticed that although Bill Seidl stated that Sable is a diploid dark red single Lacti it was originally registered as a F2 from Albiflora x Otto Fröbel. My sense has always been that ‘Person’s Sable x Eclipse’ ( apparently used to produce Val and OS ) was one of those chance seedlings that was particularly difficult to get. It’s tall, and it’s plant habit is pretty terrible, and ( If I have the right plant – I got mine from Don H. ) it’s not nearly as dark red as one might expect from Bill’s description, which leads me to believe that there were not a whole lot of Sable x Eclipse seedlings that Person was able to produce. I was never able to get it to make seeds as a pod parent, both here at my place, nor at the A’s either. But like many odd-ball crosses where only one side of the cross was a tet, I assume that it’s pollen is fertile. Having said that, I’ve not worked with it much, and I probably should. The reds of the original parents seemed to have come out more in the second generation ( i.e. Val, and OS, one of which I assume is 74H120-2) and show up as well in the third generation in seedlings from the ‘Old Soldier x Valkyrie’ seeds that Bill sent out. I’ve seen…5-6 plants bloomed from this cross ( Nate must have many ! ) 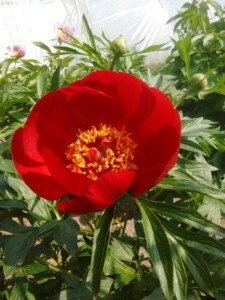 and the ones I’ve seen are all characterized by red non-glossy petals. The reds I’ve seen from these OS X Val seedings are all pretty much the same – dark, but not nearly as dark as the blackish-reds that I’ve seen in pictures of ‘Sable” or “Eclipse”. Perhaps because ‘Blushing Princess” does not have much red in it ? Using ‘Sable x Eclipse’ on something like ‘Mackinac Grand’ might be a better way to drag the really dark blackish-red out of ‘S x E’ ? Mac G freezes it’s carpals every year at my place, so this may be a cross that’s left up to others. I believe the seeds Bill mentions were some of the seeds I purchased from him, i.e. ‘Old Soldier x Valkyre’ of which a fair percentage grew out into red doubles. I selected the pollen from one of them ( field name “Asterisk”, because of it’s “spikey” flowers) to use in a big hybridizing push that I made at the time of it’s first flowering. Because it was something totally new to me, I crossed it hard with Salmon Dream, Lemon Chiffon, and Blushing Princess. I grew out perhaps 200+ seedlings, which all bloomed this year, with even more on the way for this coming spring. Granted that’s a lot of seedlings to select from, but even so, among each of those crosses, a few seedlings from each were notably ruffled, in a particularly noteworthy manner that I’ve not seen in any other peonies that I know of. Although only the tiniest percentage were red (which seems recessive when used on the pod parents I chose) the determining factor in each seems to be their OS X Val parentage. I’m not sure how Bill came to include his comments about ruffling in his post above, but given my results, I found it interesting that somehow he included it in a conversation regarding these varieties. While I don’t usually post pictures of my newest seedlings ( heaven only knows what they will look like when grown out further- sometimes they look worse rather than better… ) this should give you some idea of the ruffling I mentioned above. Yes, these things are certainly different than the lactiflora “cactus” things, and I’m excited by them myself. What I meant about varieties perhaps getting worse referred to some experiences I had this year. We had a long row of “advanced selections” which were basically divisions which were taken from seedlings which had not been divided before. Prior to division, these plants had bloomed for two seasons, and we pretty much thought we were seeing their mature flowers. But when grown on for a couple of years from divisions, they didn’t look nearly as nice as I remembered, and we got rid of most of them. 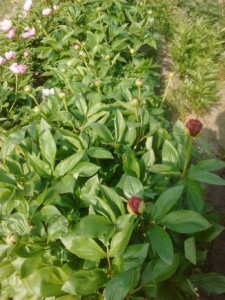 The main problem seemed to be “cigar heads” – buds with poor bud covers, which expose their immature petals long before the flower is ready to open. To the point where we questioned why we had kept these things in the first place. I’m not sure to what degree these sorts of buds are variety-specific, but I suspect that they may be. Rather than having to do with weather or growing conditions. While some of them may have gone on to make nice flowers, like open-budded things such as Red Grace and Ol’ Faithful can do, I find these sorts of buds to be ugly and discouraging. 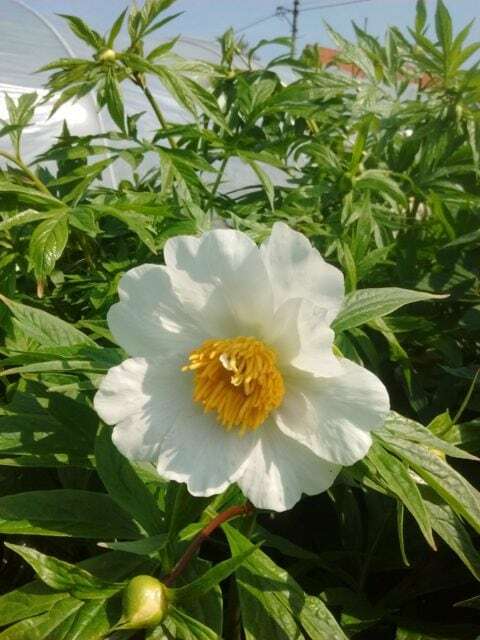 As others may be seeing with their seedlings, it’s possible to get some awfully large flowers, and herbaceous hybrids which are quite a bit more double that what we see on the market now. The price for this may be poor bud covers though. “It’s always something” is how it can frequently seem.